It has been 2 years since I couldn’t resolve this issue. The site is in Turkish. I am about to have a complete brain meltdown, just because of bbpress language issue. Come one please export a po file from the link above, and ctrl+f “Last comment” in poedit. You will see, there is nothing to translate.. The reason why I gave so much detail is to eliminate unnecessary “did you do this, that” replies. one more thing, I double, triple and quadro checked file and folder permissions. Nothing permission related. You are correct, the string Last comment, Topics/Replies are NOT bbPress strings, these strings will be in either the theme you are using with custom bbPress templates or a plugin you are using. Ok, I will do my best and add as much as translation I can. What about “by %2$s”, “replies” ? I am searching for “replies” and “by …” to translate, but I can’t find them. What is it that I am missing? I am pretty sure that will also be a string in the theme or plugin you are using, try searching for those strings in the theme or plugin you are using to modify bbPress. I’d also check with the author to see if they have setup the theme or plugin for translation. i have same issue. i can’t find “by %2$s”, “replies” section to edit in my language. i’m using newspaper theme atm, and i can not change topics/ replies section too. Cagatay, i checked your site and we’r using same theme. 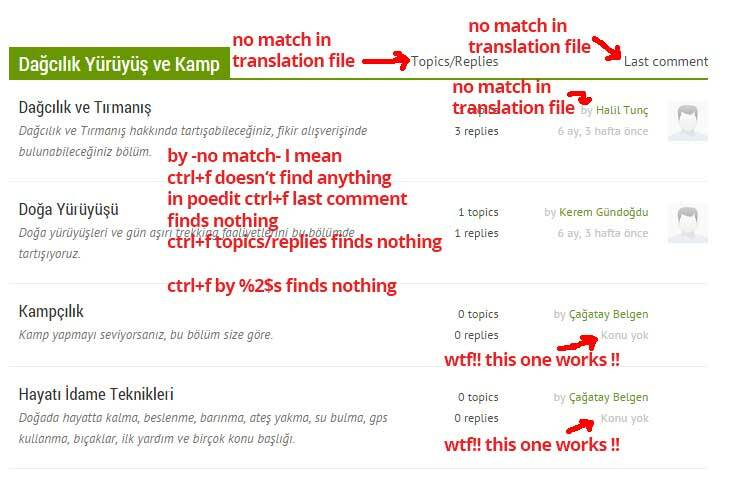 if you have any idea or find any solution how turkish can work on our forums, please let me know. And we can cooperate to solve that mindcrack problem. how did you disable breadcrumbs. i can’t find root link problem solve. So i want to disable breadcrumbs too. Root breadcrumb link does not show real root folder. @siktirella (güzel nickmiş :)) please put your url. if I understood correctly, Stephen suggests “by %2$s”, “replies” are meant to be translated through theme’s po files. still no luck. There are no corresponding translation fields in theme’s translation files. I disabled all bbpress plugins (except core), but still no luck. I contacted theme author regarding this issue, as soon as I receive a reply I will share here. @siktirella it is a good idea to work together. Please share your contact details. I found these two documents, do you see the strings to translate here? If not you’ll need to wait for the theme authors response to your question. Hi everyone. I am currently working on a Turkish site which uses Buddypress as well. Would you mind sharing your language files with me? Maybe we can alspo work together in translating the remaining fields so we all end up with a complete set in the Turkish language.